The final week at Fresh Milk was filled with excitement and disappointment. I completed the large 3 dimensional piece that I started last week. This was definitely one of my highlights. 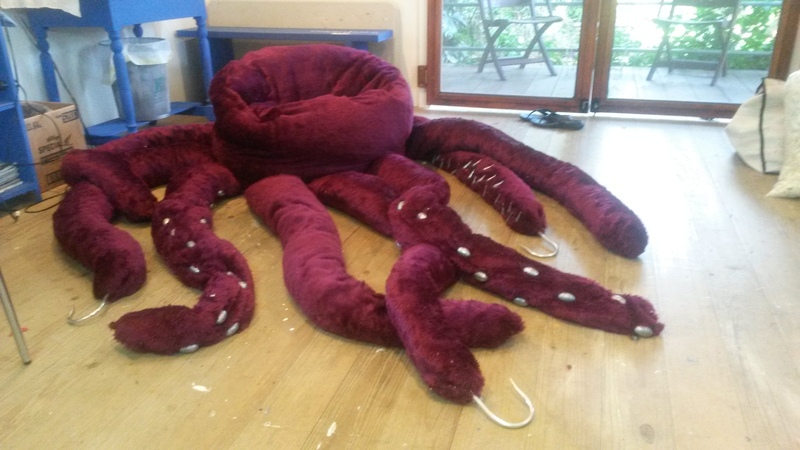 I hand stitched about 70 egg-shaped sinkers and three large hooks onto the tentacles. 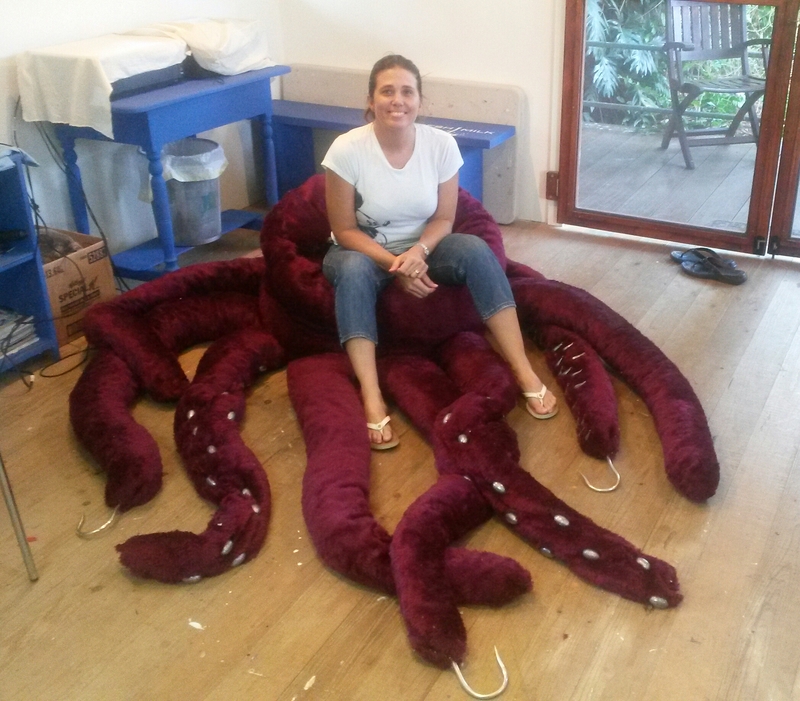 Although I thought the work to be finished, I was unsure and asked Annalee for her insight. Her response was, “I am thinking it could have a little more.” Having recalled Ida Applebroog’s quote ‘with art it either has to be too much or not enough’, Annalee’s response confirmed for me that I was indeed finished. That quote has not left me since I heard it, and it has shifted the way I look at art generally and at my own work, having a huge impact on my decision making during the creative process. In my opinion, this work poetically fulfills all the expectations I had of it from its inception. It is inviting, cozy and fun, yet dangerous to play with, heavy and somewhat burdensome; large and striking, obvious yet ambiguous. Another highlight of the week was that Leann and I watched the birth of a calf. It was quite an ordeal because the calf was too big and had to be helped out. It took a team of people to help the cow and calf make it through without harm coming to either of them. I have found being here in the “country” and on a farm quite interesting. One night there was an amazing perfume aroma similar to that of tuberose. Apparently, it was a green flower in bloom on a tree. I believe it is a Ylang-Ylang tree. Here, I am surrounded by scenes and smells that I do not see regularly, so I feel like I am truly “away”. This week Tropical Storm Matthew swirled by and the country was on lock down, so that meant I lost a day at the studio and an important meeting was postponed to October. I had planned to do a few more clay vessels, but I was unable to due to this, and so continued with the other plans I had for the rest of the week. Before leaving the residency I wanted to make one more pattern in another seat belt. Ironically, the first seat belt I found was grey, which I painted a significant blood red, but the recent ones I found were already red. I still had to paint them though, as I discovered while creating the first one that the paint helped to stiffen the fabric to stay in folded positions. I cut the belt into a pattern of people holding hands; it’s a common pattern kids use when creating these in paper. I decided to paint each person a colour – white, light brown, dark brown, black and red. The colour was a reference to the many races that make up our culture and that all are affected by the overuse of alcohol; however I did not like the aesthetic, and decided it was unnecessary to have all the colours as the monochrome red referred to all people without making it obvious. So I started again from scratch, and am way more satisfied with the outcome. I honestly love when the fabric shears and comes apart. I don’t wish for that to happen too often, but treasure when it does and I try as best I can to preserve it. While here, I also worked on a few other concepts which I have not yet mentioned: a work using bottle caps, a video and sound compilation and another with found objects. Only one of those is fully realised and completed, and that is the video and sound compilation. Knowing that I would be doing this residency, I had decided to record a sound to bring with me in case I wanted to use it. At the time, I was totally unaware of what would become of it. The sound is a memory, a classical conditioning. After I left home, and for many years since, when I heard an ice tray crack and the ice hit the glass, my whole body would tense. My body was automatically responding to a sound that brought unease and signalled it was time to tread carefully. It’s been seventeen years, and the residue is still there. I have always been aware and amazed by it, and for some strange reason I wanted to record the sound and do something with it in an art piece one day. I had never done anything like this before so I asked a dear friend of mine, Simon Pipe, who is an accomplished musician and song writer and who has his own recording studio, if he would do the recording. It was quite a different experience being in his studio, and I realised quite suddenly that sound was becoming my medium the same way I use objects or paint. We cracked ice (this we had to do over and over again, as it had to sound exactly right), dropped ice into the glass (also a specific pitch and a special glass had to be bought), we broke the tin seal, twisted the cap and poured the liquid. Now listening more intently, each sound had a beauty I didn’t notice before. And through its creation I found my reaction to what I heard changing. Around the same time, I had a totally separate thought picturing a video I wanted to produce, but similarly wanted to bring the video with me to the residency in case I should want to develop the idea. I called on another creative friend, Adam Taylor, who is a photographer, graphic designer, and now music video producer. I needed him to record my feet crushing eggs; if anyone knows my work, walking on eggshells has been a revisited theme. I knew exactly where it had to be shot and how it had to look. So with a dozen eggs and some black velvet, we met at the parquet floor for the shoot. I crushed egg by egg with my feet, the yolk and the thick clear albumen oozing between my toes, slimy and gooey and quite therapeutic. It was gross and exhilarating at the same time. At some points in life, we just need to stop tip toeing and just let the eggs break. It’s messy but it’s authentic and it’s necessary. The video came out perfectly with only a little editing needed. With no clear way forward individually for the two pieces, I decided to put them together. It was absolutely riveting. The sound of the egg crunching mirrored the sound of the ice cracking and the liquid pouring into the glass juxtaposed with the splashing of the liquescent egg was intense. I had unintentionally – and yet intentionally – made something very sensuous. And so I come to a bittersweet end to my residency. What’s next? I am not ready to leave. Here, I have found my “voice” again as I set out to do, accomplished the development of various ideas, and managed to complete more than one piece which is more than I anticipated. My new challenge is how do I maintain this momentum when I return to my “normal” life? Thank you to the Barbados Central Bank for making this residency possible. I am truly grateful for the opportunity. Thank you for recognising the potential that the Fresh Milk platform can bring to the national development of our island.